Welcome to Your Local Grocery Store! This book lambasts food producers and retailers for not doing more to help prevent diabetes, heart disease and strokes which cause huge numbers of deaths. The International Diabetics Federation (IDF) predicts that by 2035, one out of every 10 inhabitants of Planet Earth will suffer from diabetes. That would mean that 592 million people would be affected, which is greater than the total current combined populations of the United States, Canada and Mexico. It is not just wealthy people who are affected, because the greatest increases are expected to occur in South and Central America and in Sub-Saharan Africa. Already one-in-three people in some Pacific islands are afflicted. In China, 98 million are diabetic; in India the figure is 65 million and in the U.S.A. it is 24 million. In addition, the Foundation estimates that 175 million people worldwide have not been diagnosed and are unaware of the health risks that they are exposed to. Diabetes can have some serious health consequences. These include diseases of the eyes, causing blindness; failure of the kidneys; damage to the nerves and teeth. It can also affect the blood vessels and the heart; leading to an increased risk of strokes and heart attacks. It can also result in lower limb amputations. The IDF estimates that approximately 5.1 million people die every year as a result of complications associated with diabetes. That is no small number. It’s almost equivalent to the entire population of the Greater Toronto Area in Ontario; twice the population of Chicago in Illinois, and five-times the population of Birmingham in England. Some diabetes is hereditary but a lot of it is caused by bad diet. Where does that start...in grocery stores, supermarkets, at restaurants, at soft drink dispensing machines? Is the food industry doing anything about it? Only a teeny-weeny little bit! According to U.S. Centres for Disease Control and Prevention, heart disease accounts for 24% of all deaths. In the U.K. about 161,000 deaths each year are attributed to heart and coronary diseases which are the nation’s biggest killers. In Canada, 29% of all deaths are due to cardiovascular disease. Smoking is a major contributing factor as well as diet; especially foods high in fat and salt. Insofar as obesity is concerned, a lack of self-control is the main culprit but the composition of food certainly plays a role; as does diet. These play out on the shelves of grocery stores, combined with deceptive advertising that skirts around the health aspects of consuming prepared and other foods which could be detrimental to health. This book examines each of the three main culprits: salt, fat and sugar. It then takes a look at prepared foods, growth hormones and genetically modified foods. Most of the criticism is directed at the grocery trade which is more concerned about generating profits and is doing pathetically little to encourage customers to purchase healthy foods that are good for their health. INTRODUCTION: You Are What You Eat! Chapter 2: The Tsars in Charge of Salt Intake: Do They Make One Iota of Difference? Chapter 6: Are Genetically Engineered Foods Harmful? Chapter 8: "Organic" Does Not Necessarily Mean "Healthy"
Chapter 9: There's Hope in the Form of Pulses! Chapter 10: In the End....It's Your Choice....It's Your Life: YOU Can Make a Difference! 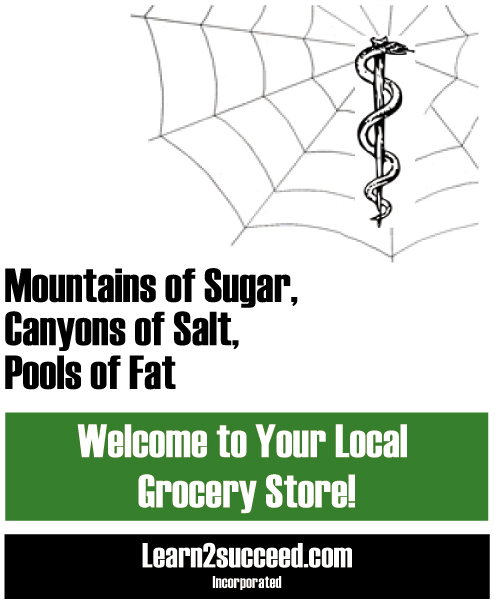 Mountains of Sugar, Canyons of Salt, Pools of Fat: Welcome to Your Local Grocery Store! by: Learn2succeed.com Incorporated: Softcover; 58 pages; ISBN: 978-1-55270-712-8 published in June 2014; $14.95.